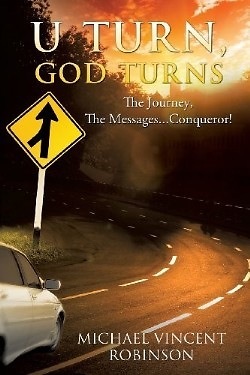 Come take the journey with Michael Vincent Robinson as he navigates you through the roads of his life. This transparent view is both down-to-earth and compelling. You will be able to feel him at every turn so buckle up and enjoy the journey. It is easy to make wrong turns. Some come out of it quickly while others take almost a lifetime to break free. No matter how long it takes, you can overcome with the help of the Lord. He alone can keep you from reaching the dead end. Just know when you make a U-TURN, God will turn your life around. If my people, who are called by my name, will humble themselves and pray and seek my face and turn from their wicked ways, then I will hear from heaven, and I will forgive their sin and I will heal their land. (2 Chronicles 7:14) Michael Vincent Robinson is a humble servant of God with a message. He holds a BS Degree in Business Administration from Oklahoma State University. He is a voice out of the wilderness to let you know that prayer, praise, and worship can unlock so many doors in your life. The author currently resides in Baltimore, MD.